The Amerian built Douglas C- 47 Dakota was adapted from the 1935 DC-3 commercial airliner which was produced until 1946, it was called the Douglas Dakota by the Royal Air Force , and was commonly referred to as "Dak" by the RAF who retired it's last active Douglas C- 47 Dakota in 1970. The RAF's Battle of Britain flight now operates an ex-Canadian Air Force C- 47 Dakota which it obtained in 1971. This picture of Douglas C- 47 Dakota is Copyright © June 2014 Siteseen Ltd. We only authorise non-commercial picture use and particularly encourage their use for educational purposes. 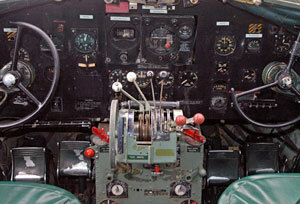 This Douglas C- 47 Dakota picture is not in the Public Domain. 3) Use of this Douglas C- 47 Dakota picture, or any of our pictures on websites re-distributing copyright free material is strictly prohibited.